Minus K's vibration isolation systems come in a variety of form factors. This bench top model is one of the smallest models, and has recently gained some popularity among audiophiles who want to protect their turntables. BUILDINGS REALLY DO SHAKE AND SWAY UNDER OUR FEET. Most of us don't even notice these low-frequency vibrations, but they can bother the researchers who use sophisticated imaging systems or test instruments. Whether the cause is the wind or a nearby HVAC system, low-frequency vibrations can wreak havoc with the data from scanning probe microscopes, interferometers, micro-hardness testers and other types of sensitive test and measurement equipment. This vibration problem mostly affects researchers who work at atomic and nanoscale resolutions, but the problem is getting worse. It's not that buildings are getting shakier. Nor are resolution needs of the research community changing. "The highest resolution requirements have been there from day one," says Mark Flowers, executive director of Nanoscience Instruments, a distributor of atomic force microscopes and related instruments used in nanotechnology research. He instead attributes the growing awareness of vibration problems to the fact that high-resolution work has become more common. With medical science and nanotechnology on the upswing, "more people are working at the highest resolutions," Flowers says. And a growing number of these efforts are commercial or even production-oriented as opposed to academic. This popularity has, in turn, led to something of a real estate shortage. Atomic force microscopes and other types of scanning microscopes perform best on a solid, stable floor. Basements have traditionally been considered the prime location for the most sensitive machines. But with increased academic and commercial use, basement space is in short supply. "All the best spots in the basement have been taken," says Ann Scanlan, president of Herzan, a supplier of vibration isolators. Suppliers of AFMs and other types of equipment now routinely deliver equipment to higher floors. Engineers who have had to contend with low-frequency environmental vibration have traditionally turned to air tables, which have the dual advantage of being both cost-effective and familiar. "Air tables have been the default solution," says Flowers. More recently, electronic systems that monitor and actively cancel vibrations have addressed the trickiest applications. What many engineers don't know is that there is also a unique mechanical solution available from Minus K Technology. Based on the sometimes counter-intuitive phenomenon of negative stiffness, these vibration isolators offer better vibration isolation than air tables at typical environmental vibration frequencies - those from 1-80 Hz or so. They also cost from one-third to one-half the price of active systems, and users say these mechanical systems do at least as good a job at quieting low-frequency vibrations. Here's a look at how this mechanical solution works and how it stacks up to air tables and active isolation systems. 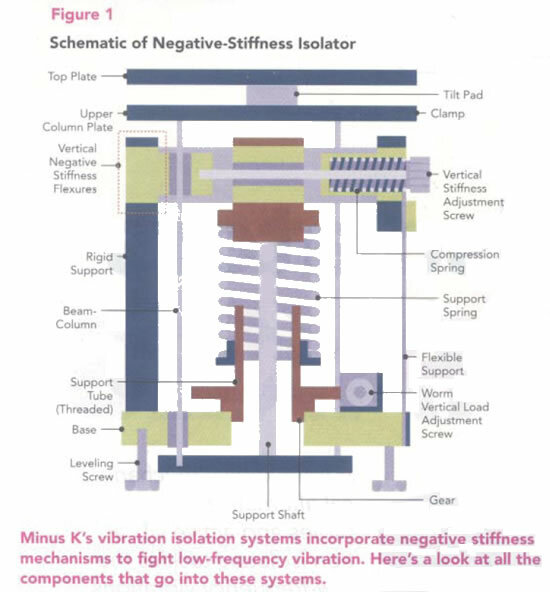 Minus K makes low-frequency vibration isolators in a variety of form factors - from small benchtop models capable of supporting a few pounds to multiple-isolator systems capable of supporting tens of thousands of pounds. What they all have in common is the use of negative stiffness mechanisms. While objects or mechanisms with a positive stiffness oppose an applied force, much the way a spring does, negative stiffness mechanisms can amplify an applied force. "Think of the negative stiffness mechanism as the opposite of a spring." says David Platus, a PhD engineer who founded Minus K Technology in 1993 after years of working on vibration isolation problems for the aerospace industry. Minus K employs two different kinds of NSMs in its vibration isolators. 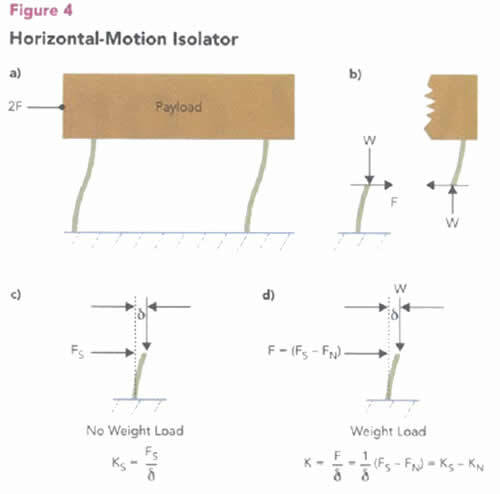 The one that handles vertical-motion isolation consists of a horizontal flexure loaded in compression at either end (see figure 1). Minus K pairs this NSM with a stiff spring to support the isolator's payload. As Platus explains, the spring and NSM achieve a state of equilibrium in which net vertical stiffness drops by as much as 99 percent without compromising the spring's static load-bearing capability. Horizontal-motion isolation comes from vertical metal columns that connect the bottom of the isolators movable mounting platform to its fixed base. 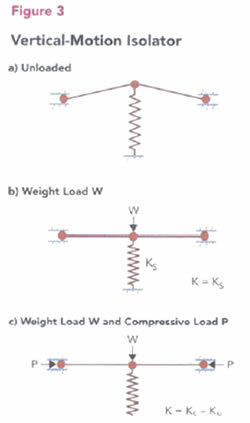 When axially loaded by the weight of the payload, the columns exhibit the "beam-column effect" that reduces their lateral bending stiffness (see figure 1). Platus says the net horizontal stiffness "can be made to approach zero as the loading on the beam columns approaches their critical buckling load." 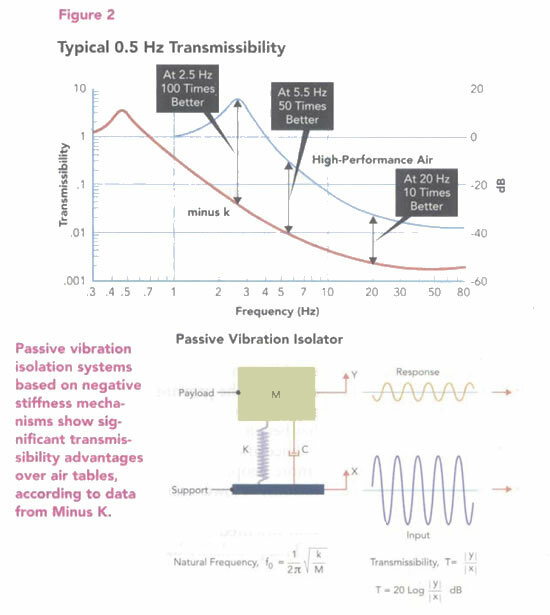 Minus K's off-the-shelf systems typically have a natural frequency of 0.5-Hz, or slightly lower with careful tuning, which is low enough by far to deal with low-frequency building vibrations that typically range from 1-80 Hz. "What you need is a natural frequency significantly lower than the vibrations you're trying to get rid of," Platus notes. Despite their popularity, air tables can't always achieve that goal. "If you're having significant problems below 10 Hz, you may not be able to handle it with an air table," Platus says, explaining that many air tables can natural frequencies that overlap with the low end of building vibrations. "Air tables often have natural frequencies around 2-3 Hz," he says. "If your environmental vibrations have the same magnitude, the air table would actually make the problem worse." This is a view that suppliers of scanning probe microscopy products endorse. "Air tables, for the most part, have been successful," says Patrick O'Hara, president of Ambios Technology, a supplier of surface metrology instruments. They've also been the most familiar and lowest cost solution - costing about half of what Minus K charges for a comparable table-sized model. But O'Hara adds the Minus K isolators have a performance advantage that becomes important in high-resolution imaging applications. "The better the vibration control, the better the image," he says. "And if you look at the transmissibility curves, they're at least two times better with the Minus K technology." Both O'Hara and Nanoscience's Flowers say they've moved away from air tables and adopted Minus K's technology when the imaging applications requires the best possible resolution. Flowers stresses, however, that many applications still don't need the best vibration control. The artifacts from low-frequency vibrations tend to be nano-sized or smaller. "Not everyone needs to work on that scale," Flowers says. For those who do work on that scale, the real competition for Minus K from a performance standpoint are active vibration isolation systems rather than passive air systems. These systems first sense and then cancel input vibration. They contain controllers and actuators that can, respectively, calculate and then generate an equal, out-of-phase force that cancels the input vibration. Herzan is a leading distributor of such systems, which are produced by Herz in Japan and TableStable in Switzerland. The company's six degrees-of-freedom active isolation systems have natural frequencies as low as 0.7 Hz, just a hair more than Minus Ks 0.5-Hz systems. And they come in both bench-top and table sizes, capable of actively handling vibrations from 1 to 1,000 Hz. Above 1,000 Hz, these systems employ passive vibration damping methods. Herzan's active systems do cost more than Minus K's mechanical isolators. O'Hara, who has used both kinds of isolators, and says the active models he has bought in the past cost just over three times as much as comparable Minus K isolators. For some isolator sizes, though, the price differential can be smaller. Hcrzan has a $7,000 system that competes with Minus Ks $4,000 model, according to Scanlan, Herzan's president. But does that added cost buy functionality that Minus K's passive isolators lack? Surprisingly, both Platus and Scanlan agree it does, though there's less agreement about whether added functionality is worth the money. One thing that active systems do better, for example, is handle sources of vibration on the isolators platform as well as internal resonances caused by the components that make up the isolator. "Nuts, bolts and screws all have their own resonances," says Scanlan. "We're able to damp those internal resonances." The active system can likewise cancel vibrations caused by equipment on the platform, such as a cable. Minus K doesn't really try to damp these smaller sources of vibration, though Platus does pick components whose internal resonances are well above 80 Hz. "Our focus is on low-frequency environmental vibration," says Platus. The active systems also require less tweaking. Minus K users do have to make simple adjustments to account for different loads. For example, they must sometimes change the compressive force on the vertical NSM. It's a simple adjustment, one performed by turning a dial. But it's an adjustment that the users of active systems don't have to make. Once installed, our systems don't require any tuning." Scanlan says. Another area where active systems have an advantage - at least for now - is in the ability to compensate for changes in load and load distribution on the platform. Scanlan notes that Herzan's systems take just 5 to 20 ms to settle. "Our platforms arc about 100 times stiffer than an equivalent 1-Hz air table," she says. Herzan's systems also include leveling motors to automatically compensate as loads shift atop the platform. Automatic compensation feature becomes important as sensitive imaging and measurement equipment moves closer to production settings, which require not just good measurements but fast measurements. It likewise becomes important when measurement systems have moving stages, which present inherent load distribution difficulties. Minus Ks systems, by contrast, take more like 6-8 sec to settle. And they require tuning not only if the size of the load changes but if its distribution changes. "High-speed moving stages have not been our strong suit," Platus says. Still, Minus K does have some tricks that make load-distribution easier. For one, the company sometimes stiffens the tilt-axis of its isolators, making them better able to stand firm against. For another, it has developed quick lock-and-release mechanism for use with moving stages. And it offers electro-mechanical device that automatically re-tunes the isolator as loads change or shift. Minus K has already dabbled in quasi-static applications that had slow-moving stages. In one recent job for a semiconductor manufacturer, for example, the company built an isolation table with a 350-lb capacity, 90 lb of which was a moving stage. The stage had to translate up to 7-inchcs in the x and y axes. And Platus believes this non-traditional application for his mechanical isolators is just the beginning. "I'm sure there are many applications out in industry that we haven't even thought of yet.